Good morning, happy Tuesday. I am officially back, though it feels like my brain is still on vacation. It's sitting in a beach chair watching a chicken try to eat a coconut on the rocky beach outside of the villa. I'm confident I could stare at this screen for another four hours and not get a single thing done. That very well may happen today, but I'm going to try to push through it. There are too many highlights from our trip. Most of them include Amy Poehler and Will Arnett, neither of whom were actually on this trip with us. I wore this outfit out to dinner one evening. Since the majority of the trip is so casual I always like to pack a few skirts and dresses to wear out in the evenings to make myself feel a little more put together. 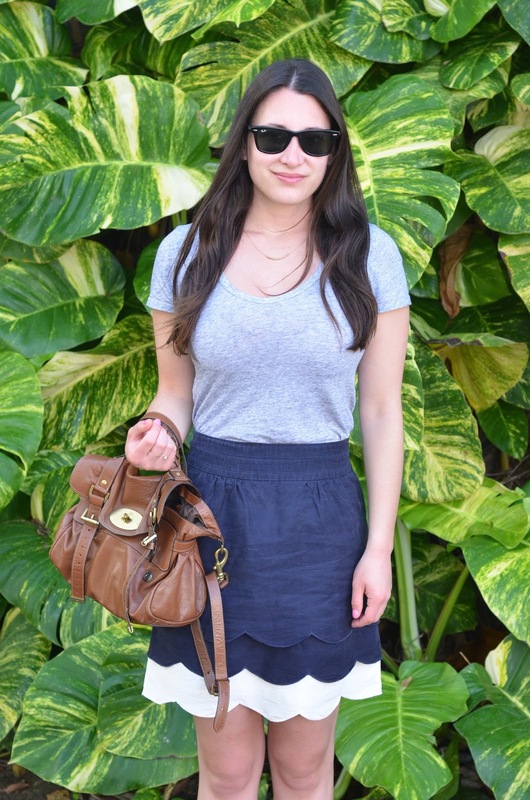 I paired this scalloped skirt from Anthropologie with a simple gray tee that I re-wore to the beach the following day. I love doing that, it's an excellent way to get the most out of your suitcase without overpacking. You look lovely! I so enjoyed all your Instagram shots- the vacation looked amazing! 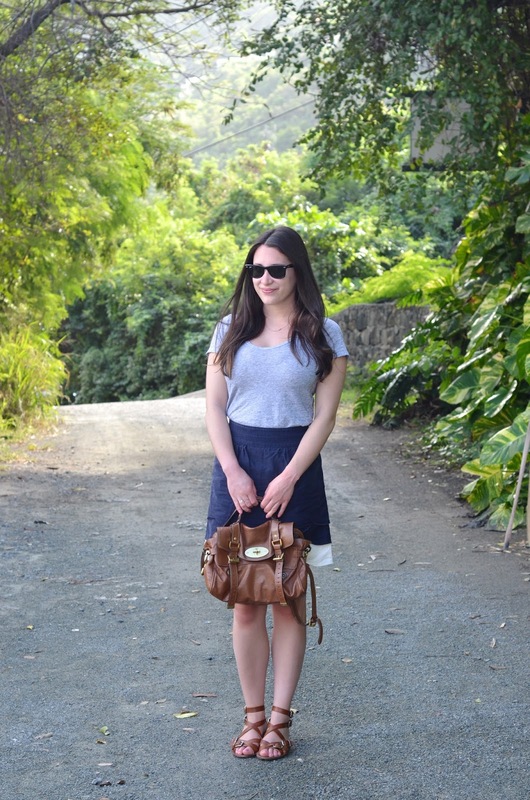 such a sweet look, and perfectly dressy for a beach trip. i loved all your instagram shots and hope you'll share more about the vacay! ps: these pictures turned out AH-MAZING!!! Absolutely love this skirt!! Warm weather looks fabulous!! Absolutely love these sandals! Sounds like a super fun trip! love those sandles ! happy new year ! Yay!! Hope you had an amazing trip!!! 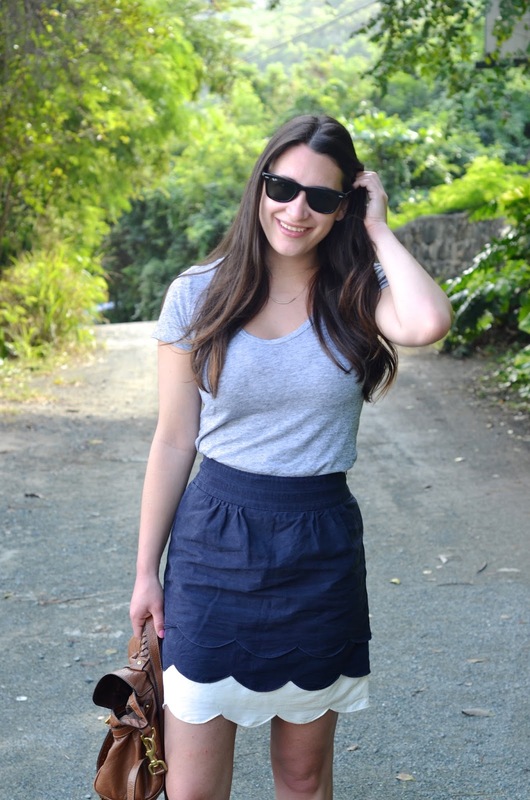 Still in love with this skirt! So cute and perfect for dinner! Love how you made it a bit casual with a t-shirt too! That skirt is super cute! Glad to hear you had a fun trip!! Welcome back! Tagging along through Instagram was incredible but made me SO jealous. This look is ideal for what I can imagine was perfect weather. You look flawless! So jealous of your vacay! Love that skirt!